England could play games around the country if Wembley gets an NFL team. The Football Association is keen to boost revenue, while the NFL would like a team in London. However, NFL UK managing director Alistair Kirkwood said it is "still not at the stage" where London could sustain one of its franchises. 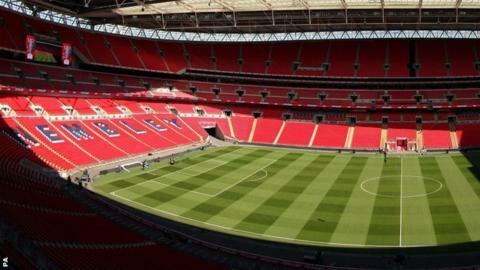 The Football Association is obliged to hold matches at Wembley until 2017, while the NFL has previously suggested it would like a team there by 2021. England played at grounds including Old Trafford, Villa Park, Stadium of Light, St James' Park, St Mary's and Leicester before the rebuilt Wembley opened in 2007. The national team's recent friendly against Norway drew a crowd of 40,181 at Wembley. The previous lowest crowd for an international at the new stadium was the 48,876 for a friendly against Sweden in 2011. In contrast, the first of three NFL games to be held at Wembley in 2014 - Miami Dolphins' 38-14 win over the Oakland Raiders - was played in front of 83,436 fans. The other two games - Atlanta Falcons v Detroit Lions and Jacksonville Jaguars v Dallas Cowboys - have also sold out. Speaking to BBC Radio 5 live, Mr Kirkwood said: "We're very interested in exploring the idea of a British-based franchise and seeing if we can pull it off. "Fan growth has grown considerably in recent years. But we've seen in all forms of sport, having something that's considered national really transforms your potential popularity." However, he warned that there are significant issues to be overcome if the NFL is to have a London franchise. "It's not just about the logistics of where a team might come from or whether it would be a new team, it's also scheduling, air travel, a tonne of other logistics," he explained. "If we were to finish it off, it would be a big project realised." Club England chief executive Adrian Bevington suggested on Twitter last month that it could be eight or nine years before the cost of rebuilding Wembley was recouped and England might be able to tour the country again. "Wembley has to be paid for. The reality is that the FA has to put [an] events calendar on to do this. When [we are] debt free in 8/9 years, [we will have] more choice," he wrote. Last year, Wembley managing director Roger Maslin said he was confident the stadium could stage a whole season of eight NFL games. "Football is our priority. But yes, I'm absolutely confident that if the NFL wanted to have franchise here then we could absolutely do it," he said. Seven years until London Jaguars? Read more on NFL Wembley: Seven years until London Jaguars? Rams? Raiders?